Motherboard maker ASRock is showing off a wide range of new boards at Computex, as well as some complementary PC components and accessories. 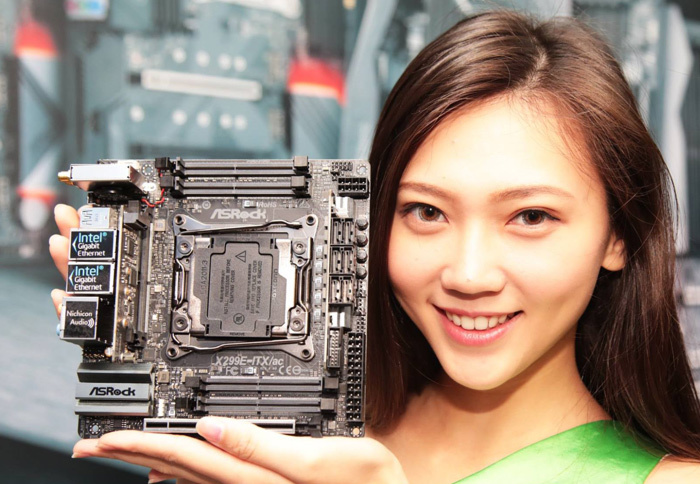 You can get a brief overview of the highlights of ASRock's exhibition stand via its blog post overview article. In summary, ASRock is offering a new range of Intel X299 chipset motherboards, Mini-ITX AM4 motherboards, new Bitcoin mining specialist motherboards, a pair of SFF chassis, and its X10 IoT router. However, today I'm going to highlight ASRock's Mini-ITX motherboards for Intel Core-X based, and AMD Ryzen based-systems. 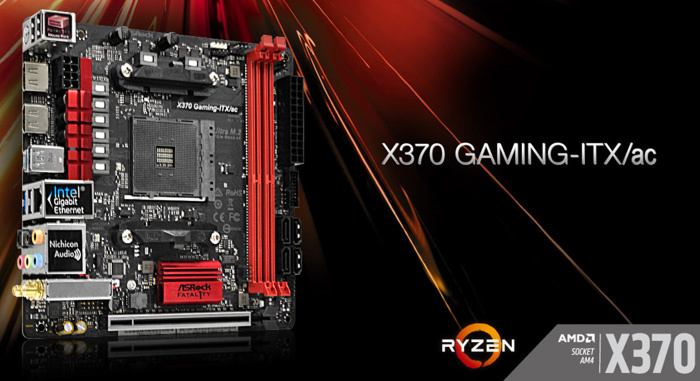 The ASRock X299E - ITX/ac is claimed to be "the world's first and only mini-ITX X299 motherboard". It's a tiny size but this motherboard can accommodate a good selection of integrated components and expansion. For example it includes 4x SO-DIMM sockets, two Intel Gigabit LANs, dual band 2.4/5GHz 802.11ac Wi-Fi and Bluetooth 4.2, 6x SATA ports, plus triple M.2 sockets onboard. There's a single PCIe 3.0 x16 slot for your graphics accelerator of choice. As AnandTech observes, the board is rather tightly packed, and it reckons that the close integration of the LGA 2066 socket, four DIMM slots, and high-capacity VRMs is a "remarkable engineering achievement". A possible negative side effect could become apparent depending upon your go-to cooling solution, especially as the vertical slot-based USB 3.1 controller, SATA ports and an M.2 slot could encroach on the vital space surrounding the CPU socket. 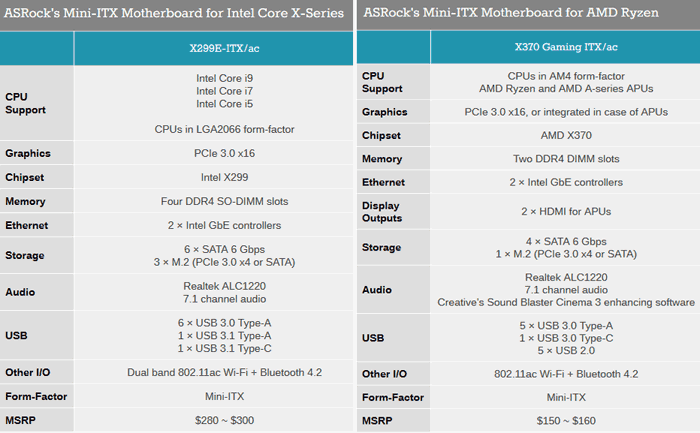 Full specs are tabulated below, next to ASRock's Mini-ITX AM4 motherboard specs. ASRock is also pioneering Mini-ITX for AMD Ryzen users. The ASRock Fatal1ty X370 Gaming ITX/ac features the X370 chipset, if you had not guessed. It features all the essentials you might wish for in such a compact motherboard. 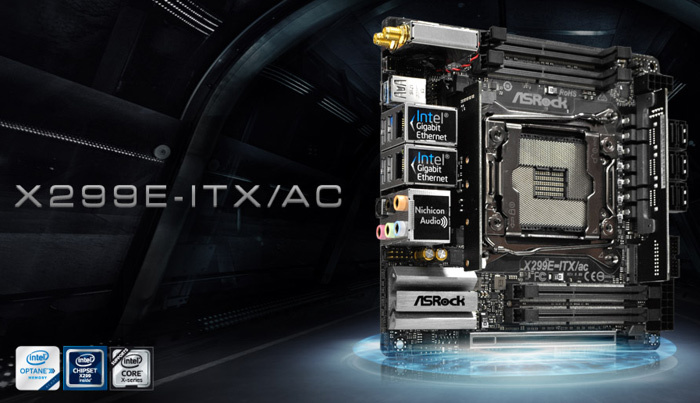 ASRock is also launching the Fatal1ty AB350 Gaming-ITX/ac. Standard features of the two tiny AMD Ryzen motherboards include two (APU friendly) HDMI outputs, an 802.11ac Wi-Fi / Bluetooth 4.2 solution, 7.1-channel sound with Realtek ALC 1220 codec, and custom heatsinks. Elsewhere on the X370 motherboard there are two DDR4 DIMM slots, two Intel Gigabit Ethernet ports, and USB connectivity via 5× USB 3.0 Type-A, 1 × USB 3.0 Type-C, and 5 × USB 2.0. As you can see in the Anandtech specs list above, the price is far keener than that of the Intel X299 board, possibly half the price, though it is noted retailers might gouge customers as such boards are currently rare and in demand. Shoehorning an X370 chipset onto an ITX mobo is all well and good, but where are the SFF X300 boards that we were promised? Are they going to end up OEM only? SFF enthusiasts want to know!